Back in April, I posted an article about how to make a big beer smaller, but still keep the flavor. 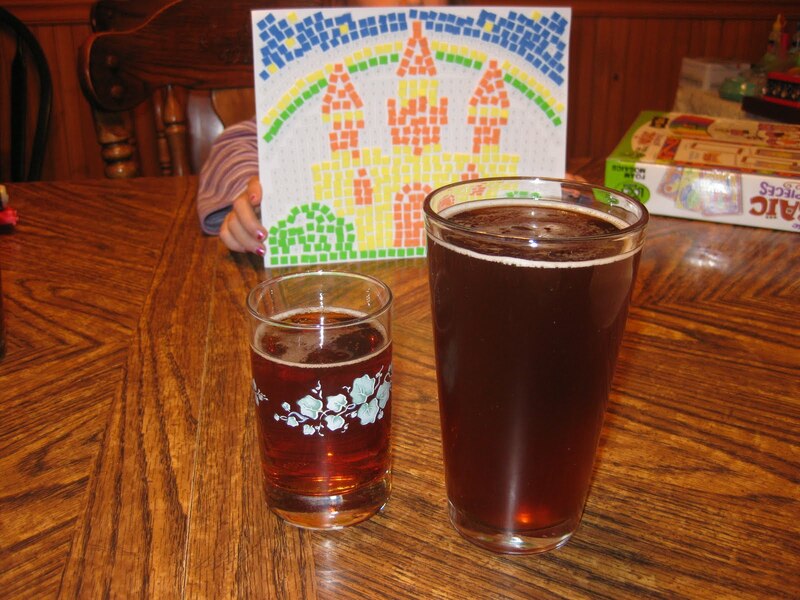 The basic idea was to take a high alcohol beer recipe, in this case, our Midnight Wheat - Wheat Wine Braggot, and make a version of it that was lower in alcohol. The base recipe is one of my favorite beers that Jeff and I have done together, but at 11% alcohol by volume (ABV), it is not a daily drinker. Using some techniques I described in the previous article, I hoped to make a session beer with much of the same flavor as the original. The recipe, entitled Midnight Mini-Wheats, can be found at the bottom of this post. My friend, John, my wife, and I recently had an opportunity to taste the two beers side-by-side (wheat wine braggot is on the left in the picture). This is the best way to compare similar beers, as it is easier to compare subtle differences when the flavor and aromas are so fresh in your mind. Appearance: The braggot pours extremely clear deep amber color, with a thin white head. The carbonation bubbles are very fine, almost like champagne. Aroma: The braggot has a complex sugar aroma that is very apparent. It contains hints of brown sugar, toffee, caramel, and even a bit of molasses. The sugar character is also mixed with the sweet aroma of alcohol. Flavor: The braggot tastes much as it smells, with a layered complex sugar character. Molasses is the key dominant character, and reminded the tasters of shoofly pie. There were also elements of brown sugar and caramel in the flavor. 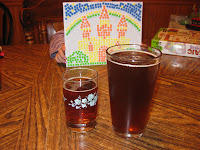 The tasters compared the braggot to a commercial beer, Lagunitas Brewing Company's Brown Shugga. Appearance: The beer pours a hazy deep amber color, with a thin white head. The carbonation appears lower than the braggot. The tasters suspect that the beer has not aged as long as the braggot and has not had a chance to drop out some of the malt fines, which makes it cloudy. Aroma: The beer is very neutral in smell, with a very faint malt aroma, but little else. The tasters noted the lower carbonation level between the two recipes, which could prevent as much aroma development. Additionally, braggot's higher alcohol may well have driven its complex and layered aroma. Flavor: The beer has a distinctive grainy character, much like one can get from straight pilsner malt. The beer also has a slight bitter and sour edge to it, which was even more noticeable when the beer was younger and less carbonated. The beer lacks any of the sugar complexity that makes the wheat wine braggot so interesting. On flavor alone, they are very different beers and, as my wife said, the drinker would likely have no idea they were related unless told so. In conclusion, the experiment to get the interesting flavors of the wheat wine braggot into a session beer failed. While the Midnight Mini-Wheats is a good beer, it was definitely found lacking. However, I am going to take some of the lessons I learned here and try again in the future. For one thing, I will only try to get down to 6% ABV, as the braggot's alcohol contribution is so important. The braggot also had a much larger honey character, so I will try to boost the honey percentage in the next batch, while increasing mash temperature to keep a solid body to the beer. The next batch will also receive a higher level of carbonation.